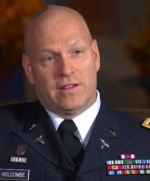 [Lt. Col. Philip Holcombe] So there are some things with regard to post-traumatic stress disorder that a parent might do that's good common sense safety. Parents with post-traumatic stress disorder also need to understand that they may be doing some things that are a results of that hypervigilance. And children are like sponges from very early on. Not only do they understand fear, but they can read their parents. Babies can exchange facial expressions with parents. A baby can look at a parents who's about to cry, and the baby will start to cry. And the baby doesn't even know why. They see the fear, the concern, the distress in the parent's face, and they are like a mirror and a sponge. So it's very important that parents are able to engage their children and explain to their children in what they're doing makes good sense, but also to be able to communicate to their children how to engage the world in safe ways. So to be aware that the way that I'm telling my child to engage the world needs to be based upon common sense safety, not on my broken danger probability meter. The other thing is that sometimes parents with post-traumatic stress disorder need space. They may feel themselves starting to become angry, and this can happen with all parents, but certainly with post-traumatic stress disorder. They may feel themselves starting to become angry with their child's lack of thoughtfulness or not responding and doing what I need them to do as quickly as I need them to do it. And they may need space. They need to explain to their child that sometimes Mommy or Daddy just needs space and needs to calm down for a little bit, and that it's not the fault of the child. Children think often that they're the center of the world and that what happens is because of something they do or they don't do. So it's very important to establish the kind of bond with a child that you can say to the child, "This is about Mommy or Daddy needing some space right now or needing to work on some things." As children get older, they're more able to understand the complexities of world politics, of war, even though it may be hard for any of us to really get it, but they certainly become more able to understand those things. They become more able to understand that they can feel differently than a parent. The parent with PTSD can feel like they're not safe, but the older child can still feel safe. Their emotions become less dependent upon the parent's emotions. But it's still very important that the parent with PTSD let the child know when they need space. It's also important that when a parent of any sort, with or without PTSD-- and again, certainly with PTSD, makes a mistake, it's very important that the parent be willing to say, "You know what, I made a mistake. I told you, you couldn't go to the mall with your friends, it turns out I was having one of my probability danger meter broken moments. I know those people that you're going with, those are safe people, you can go." So to be able to call it themselves. The other thing is sometimes a behavioral health provider can help educate the family in ways that the patient with post-traumatic stress disorder may not have even thought to do. So sometimes they need to have the behavioral health provider help them do that. And I think probably the most important thing for parenting in general and with regard to post-traumatic stress disorder is to remember the number one issue is the quality of bond between the parent and the child. The ability to take space when you need space so that you don't endanger that bond. Take space when you need it, take care of yourself when you need to take care of yourself, accept responsibility for your emotions in ways that your kids know that that's what you're doing, and encourage your children that you're working to do the best that you can do to address what you need to do to be the best parent you can be, even though you've experienced difficult things. Now let me just say this real quick. With regard to discussing a trauma with a child, you need to be very thoughtful about that. It's something you may even want to talk to a behavioral health provider about— a child psychologist, a child psychiatrist— to determine whether or not you really should do that. Again, it's just as important for children to have a sense of safety as it is for the parent. So it may depend upon the trauma. There may be some things less concerning than other things. So with regard to talking about the specifics of a trauma, it may or may not be helpful and should be thought about very carefully, and I would recommend with a behavioral health provider who knows child development.